In working on a recent project I started getting a bunch of big red X marks in the XAML designer due to various issues in design time. To fix it, I had to debug into the XAML designer itself. Close all instances of Visual Studio. Enter the command setx XPROCESS_PROMPT 1 and hit enter. Open the problem project in Visual Studio and get to the designer to trigger the problem. 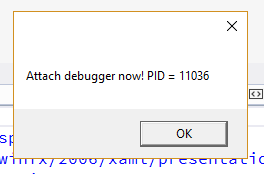 When the designer is about to start, you’ll get a little dialog box telling you exactly which process to debug. Open a second instance of Visual Studio and attach to that process. Make sure in the “Attach to Process” dialog you select “Managed (v4.6, v4.5, v4.0)” - you may have to manually change the value here. If you’re interested in setting a breakpoint on your project code, open your project in that second copy of Visual Studio (the one attached to XDesProc.exe) and set your breakpoints. Click the “OK” button in the “Attach debugger now!” dialog to allow the first instance of VS to continue the design-time rendering. When you’re finished debugging you need to turn the prompt off or it’ll keep happening when you start the designer. Enter the command setx XPROCESS_PROMPT "" (yes, empty double-quotes) and hit enter. Gotcha: This doesn’t help with assembly binding problems. The problem I was having was an assembly binding problem. The red X in the designer pointed to an error where an assembly couldn’t be found at design time. It was there fine at runtime, but for some reason the designer couldn’t find it. The designer creates a separate folder in the unique app directory for each assembly it shadow-copies. Not everything in your app’s bin folder actually makes it to the shadow copy. That latter point - that not everything makes it to the shadow copy - was causing my problem. I never did figure out the logic behind what does get to the shadow copy vs. what doesn’t get there. Adding a direct reference to the assembly or NuGet package doesn’t necessarily guarantee it’ll make it. When you run into this, you get managed C++ errors trying to marshal FileNotFoundException info back to .NET but without any requisite inner exception or stack trace details. It’s basically impossible to figure it out unless you want to start trolling through memory dumps and WinDBG. That would tell you what’s missing but still wouldn’t reveal the logic as to why it’s missing. Make judicious use of design-time checking via if (DesignMode.DesignModeEnabled) checks in appropriate places to behave differently in design. Use knowledge of how the JIT compiler works to separate code that requires the missing assemblies from code that needs to run at design time. Let me expand a bit on that latter one, since it’s key. When the XAML designer executes code, it only compiles the code it requires to run. If it touches a type in the system, it compiles it (from the MSIL code in the assembly) so it can be used. Say you have a control MyControl. MyControl has a view model MyViewModel which then uses an EF DbContext to get some data. If all of that is in code in MyControl then the designer needs to compile MyControl, MyViewModel, and the DbContext. If the designer can’t find all the required EF assemblies, the DbContext compilation will fail, which means MyViewModel will fail, which will bring the whole design time thing crashing down and yield a red X. To get around that, you can create an interface IViewModel with the properties on MyViewModel. Add IViewModel to MyViewModel and create a second view model just for design time - DesignViewModel - that also implements IViewModel with some simple properties. Now in the constructor of your control, you set your control’s view model to the DesignViewModel when DesignMode.DesignModeEnabled is true. MyViewModel can be passed in as a constructor parameter from elsewhere or set as the data context later in other code. Point being, you’ve now separated your control code from the view model code by using an interface - and the designer won’t need to JIT compile the full “real” view model, so it won’t look for assemblies that aren’t there and you’ll get a good design time experience. Yeah, it’s sorta complicated. If I could figure out the logic of what causes the designer to bring an assembly into the shadow copy I’d just, uh, “flag” the missing assemblies (or whatever) and bypass this whole complex thing. UPDATE 10/25/2017: This may be fixed as part of this issue in VS 2017 15.5. Alex and I have been working on deprecating the ability to update an Autofac container after it’s already been built. There are lots of reasons for this, and if you’re curious about that or have feedback on it, we have a discussion issue set up. You can also see ways to work around the need to update the container in that issue, so check it out. To that end, in version 4.4.0 we’ve added OnlyIf() and IfNotRegistered() extensions to support conditional registration. OnlyIf() lets you provide a lambda that acts on an IComponentRegistry. You can check if something is or isn’t registered and have some other registration execute only if the predicate returns true. IfNotRegistered() is a convenience method built on OnlyIf() that allows you to execute a registration if some other service is not registered. // Only ServiceA will be registered. // so the IfNotRegistered check won't find it. // IfNotRegistered can only check for "As"
// can allow a lot more flexibility. If that’s something you’re into, head over to NuGet, grab v4.4.0 of Autofac, and try it out. Find something not working? Let us know! One of the challenges I’ve seen when trying to communicate to non-technical folks about things I find in NDepend is cost. “How much is it going to cost to fix issue X?” Estimation is a tough thing. Now NDepend can help you with that. How many work hours are in a day / work days in a year? What’s the average cost of a person-hour (and in which currency)? What are the various thresholds that define issue severity levels? There are quite a lot of configuration options. Luckily, NDepend provides a lot of good doc on what the settings mean so you can configure them based on your project/company. And if you have a lot of projects that use the same settings, you can share the settings with a central .ndsettings file. For my example, I’m just using the default settings. Once you have that set up and you run analysis, your dashboard will show you your debt “rating” based on the SQALE method and estimate the amount of effort to improve the code to the next rating. The little “Explore Debt” button there will open up a query window that shows, for example, how much it would cost to fix each of the various queries you’ve applied to the code. In this case, you can see that this project has some pretty extensive debt related to the UI talking directly to the data access layer - 47 days’ worth if I wanted to fix it all! However, I might be able to fix up some static field naming conventions in a couple of days and save myself a day’s worth of interest accumulating each year - head it off before it gets too big. I can also look at a prioritized list of types to fix - places I might get the biggest bang for my buck. How much is it going to cost in terms of money, not just time? Obviously it may take some tweaking of the settings to reflect the situation in your environment, but this is a huge help when it comes to communicating cost/benefit when looking to update code that is working but is worth cleaning up. And, of course, you shouldn’t let anyone instantly just take it as gospel. It’s a tool. It will help you get started and make it easier to communicate, but you really shouldn’t substitute a generated estimate for something provided by the people actually doing the work. Go grab yourself a copy of NDepend 2017 and get estimating! Full disclosure: I got a free personal license from Patrick at NDepend. However, we have also purchased several licenses at work and make use of it to great benefit. Over the years I’ve pushed out a lot of little downloads, source, and code snippets on my blog. Yesterday I finally got all of that moved out of the various little dump sites on disks and in private repos and into GitHub. It was kind of a blast from the past looking at some of that stuff. I can see how I’ve changed styles and improved. Who doesn’t look at stuff they wrote 10 years ago and shake their head? I could also see where I used certain tools or tech back then and don’t anymore. Like… remember when T4 didn’t exist and CodeSmith was the way to generate things? Anyone remember the Prototype JS library? Building with NAnt? I can’t promise all of it will compile as-is. For example, I see a lot of VS 2003 and VS 2005 solutions in there. Will that straight-up convert to VS 2015+? Your guess is as good as mine. Anyway, it felt good to get things centralized, even if it’s not all stellar code. Captain’s Log: December 9, 2016. School has been canceled for the second day in a row. The school district claims this is due to “potential safety concerns” for people coming in from higher elevations where there may be ice and snow, but our vessel is less than one mile from the school and there is nothing on the ground, nor is there anything falling from the heavens. I think it’s a plot. Of the regular crew of three, only two of us remain on board. The XO has gone on an away mission to work leaving me here with the first mate. I am attempting to address my standard duties but the first mate, being (what I understand is) a typical six-year-old, is fairly needy and in a constant attempt at mutiny. I have considered throwing her in the brig but given the smallish size of the vessel, such sentences don’t last very long and definitely don’t have the desired effect. I have, however, informed her that if she continues her mutinous trend that her very life may be in danger. We’ll see how long she lasts when I throw her overboard into the icy waters. There is constant rumblings of “nothing to do” and “super bored,” the suggested remedy for which is, naturally, “more television.” I have suggested several alternatives based on the diversions available on board, including - but not limited to - Barbies, Magnatiles, LEGOs, art projects, Playmobil make believe, stuffed animals, play kitchen, tea parties, dress up, and other various combinations of toys with inventive scenarios. None of these placate the desires of the restless first mate. I was sitting in my office attempting to work through the daily reports. As I was sitting here, I heard a small but growing call. I raced from my office to find the cause of the call. The first mate was sitting eating breakfast. This sort of interruption occurs, as mentioned, fairly regularly. Either a call comes in or the first mate enters unannounced to make a nonsensical request. I would ship her off to a neighboring vessel to play with one of her crewmates but I’m unfamiliar with the other ships’ captains so that’s not really an option. I believe one of her crewmates lives across the street. I will make a note to become more familiar with that vessel so I am not caught by surprise like this again. Should our boat sink within the next few hours, this log explains the brewing storm being faced. There is a high probability that the first mate’s mutiny will succeed before the XO returns. When I am done with this log I will raise a distress call on the radio to see if any help may be coming. I have little hope.